Want to make some Valentines and some memories? Then join us for our Valentine’s Day Open House & Story Time. Saturday, February 9th, from 11 a.m. to 1 p.m., the Library will be hosting a story time with a card-making station. 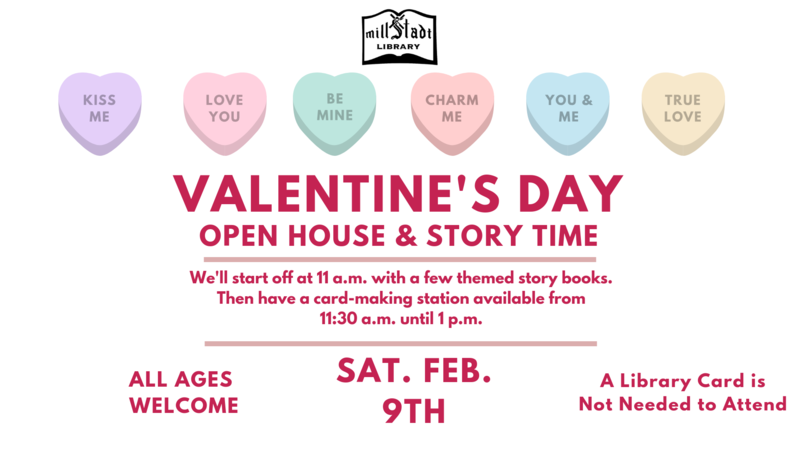 We’ll kick off the program with a few Valentine’s Day themed story books at 11 a.m. and then we’ll have a card-making station from 11:30 a.m. to 1 p.m. As with last year, this will be an all ages event and you do not have to have a library card to attend. For more information, check out our event page on Facebook, @MillstadtLibrary, give us a call at 476-1887, or stop by 115 West Laurel and talk to a librarian.